The Arlington County Board today approved changes to the site plan, a license agreement and a use permit related to the Ballston Quarter development project originally approved in 2015. The site plan changes extend the required completion date for the pedestrian bridge over Wilson Boulevard to early spring 2019, and allow for canopies and an entrance vestibule planned by mall tenants. The license agreement and use permit allow nearby Mosaic Park to be used for construction staging and assembly of the new Ballston Quarter Pedestrian Bridge before planned park improvements get underway there next year. The Board voted unanimously to approve the site plan amendment, and to approve the license agreement and use permit for use of a portion of Mosaic Park, in adopting the Consent Agenda. To read the staff reports, view Item Nos. 5 – 10 and 23 on the agenda for the Saturday, July 14, 2018 County Board Regular Meeting. The Ballston Quarter mixed-use redevelopment of the aging Ballston Mall is a public-private partnership between the developer, Forest City, and Arlington County. Ballston Quarter will include a shopping and entertainment center, expected to open in fall 2018, and a new residential building, set to open in spring 2019. Planned bridge at Ballston Quarter. 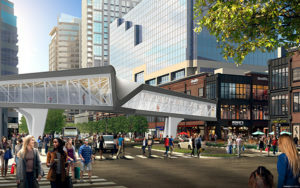 Construction of a new pedestrian bridge that will span Wilson Boulevard, connecting Ballston Quarter to the Ballston Exchange building at 4201 Wilson Blvd., is a requirement of the larger Ballston Quarter project. The conceptual design for the pedestrian bridge was developed through a community process in 2016. Forest City finalized the design, and now is preparing to start construction. The bridge is about six months behind the original construction schedule, and now is expected to be completed in early spring of 2019. The site plan amendment approved today requires Forest City to provide the County with a financial guaranty for the completion of the bridge. This surety will need to be provided before the first Certificate of Occupancy is issued for the mall. If the pedestrian bridge is not finished by June 1, 2019, the mall would not receive any new Certificates of Occupancy until the bridge is completed. To help ensure the bridge’s timely completion and to mitigate construction impacts, including traffic interruptions along Wilson Boulevard, some of Mosaic Park’s casual use space will be the staging area for construction of the bridge. Located at 538 N. Pollard St., the park is the only nearby area large enough to stage and assemble sections of the bridge span before installing it over Wilson Boulevard. County staff and Forest City plan to mitigate impacts on park users by providing a buffer area around the playground and maintaining space for casual use. The construction staging is not expected to interfere with the project timeline for improving Mosaic Park. The County Board approved the Ballston Quarter redevelopment project, bounded by Wilson Boulevard, N. Randolph Street and N. Glebe Road, in November 2015. Citing broad place-making interests and economic benefits for Ballston, the County entered a public-private partnership to finance portions of the public infrastructure and improvements within the project. The new Ballston Quarter will transform the aged, interior-focused Ballston Common Mall into a more dynamic, accessible place featuring outward-facing, street-level retail shops, a new public plaza and an improved streetscape. To learn more, visit the County website.